Earlier today Artvoice published a cover story on what a Buffalo Bills footbal stadium would look like if it was located in downtown Buffalo. To bring their vision to life, Artvoice enlisted the services of University at Buffalo School of Architecture and Urban Design professor Brad Wales. The result was the stunning image above. 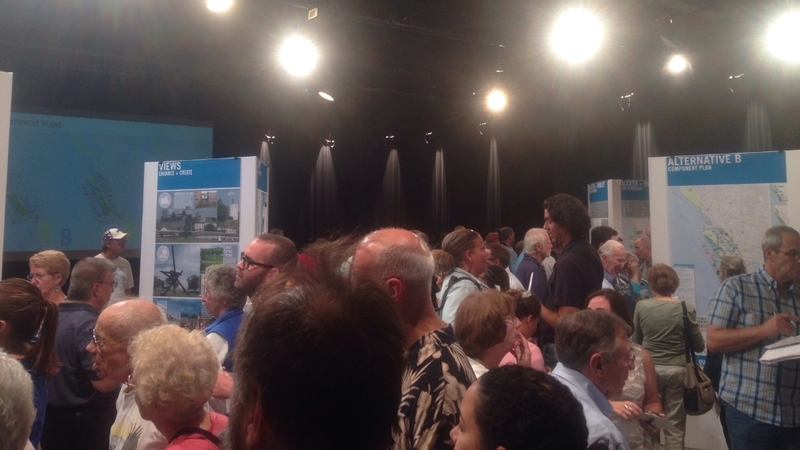 Last night, I attended an open forum hosted by the Erie Canal Harbor Development Corporation and held at WNED studios. The title of the forum was "Buffalo Outer Harbor Open House: Presentation of Alternative Concepts", and about 200 or so people attended the presentation. Participants at last night's public forum were asked to rank the concept designs for Buffalo's waterfront. A downtown stadium was out of the question for the Erie Canal Harbor Development Corporation. Many interesting designs were presented to members of the audience and each attendee was then asked to fill out a scorecard which they could use to rank their favorite concept design, based on what Buffalo's waterfront should look like in the future. Presumably, the most popular design would be adopted by the ECHDC and used as a blueprint for future waterfront development. During the presentation representatives of the ECHDC presented several findings based on feedback they received from previous open forums. Among these findings, it was revealed that the majority of participants did not want a downtown stadium. With that being said, ECHDC representatives declared that they have have no desire to pursue the integration of a downtown stadium within any of the concept designs going forward - though they did leave some wiggle room pending the findings of another study currently being conducted by the State of New York. Until then, the message was clear: a downtown stadium was out of the question, case closed. In a very timely fashion - only a day after the ECHDC announced where it stood on the issue - Artvoice published an interesting article emphasizing the positive attributes of a downtown stadium. Here's the story. It seems many of us have a different take on where the Bills should play. Click here if poll does not display above: "Should The Buffalo Bills Relocate Downtown?"